I grow up loving Hokkien Mee from young. Not made by mum though. Where Indian mothers those days know how to fry Hokkien Mee and they won't even because in an Indian household generally, it must be Indian food or maybe, once a while thrown in Malay dishes. Where then my fix of Hokkien Mee came from? From the roadside Chinese stalls in Brickfields. Of course now, its a different cooking matter for me personally. I cook Chinese noodles (Penang Hokkien Mee). Maybe not so often, and the food training I have given my Indian half-half seemingly is working. He is food fine for Chinese noodles, but I can't push my luck very far. Curries are still a domineering food fact, yet, a plate or bowl of noodles is food appreciated too (Lamb Pho). 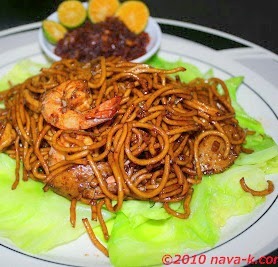 Hokkien Mee. Soy sauce, seafood and cabbage, wet soggy thick yellow noodles. The halal version. **Fry all these ingredients in oil till aromatic. Heat oil and fry garlic, squid, prawns and fish cake for about 2-3 minutes. Add mee, light and dark sauce, pepper and water. Season with salt (just a bit please). Stir until mee is cooked. Pour cornflour mixture and quickly stir. Arrange blanched cabbage on a serving plate and add fried mee on top. Serve with dipping sauce and calamansi lime. Aww...I feel like eating this now. I hope I too am so much curious as you to prepare such a lovely seafood dish. Wow!! looks super yummy and spicy..